Come home to Hope Harbor–where hearts heal . . . and love blooms. 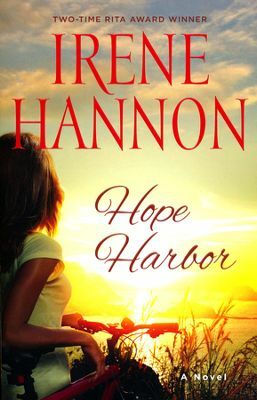 Hope Harbor is the first of Irene Hannon’s books that I’ve read and I give it five out of five stars. I’m excited to have found a new author with a plethora of books to choose from. My “To Read” pile just grew! Hope Harbor is appropriately named. The beauty of the location and the small town atmosphere is a perfect setting for the hopeless to heal. It’s home for Tracy and a place of refuge and contemplation for Michael. Tracy loves her home and finds purpose and devotion in working the family farm. Her devotion has cost her dearly in the past and she must decide if it’s all really worth it. Michael is longing for resolution and hopes to find it in Hope Harbor. Although he thinks he’s going to spend the time deep in thought Michael finds himself pouring out his gifts in those around him and in doing so, he may find the answers he is longing for. By far, my favorite character is Anna Williams. Anna has a haunting past that has cost her everything that ever meant anything to her. In isolation and seclusion, Anna has learned to survive but the loneliness she feels cannot be replaced by the surrogate friends she’s surrounded herself with. Without her knowledge or approval, Michael Hunter has managed to break through the prison of isolation and in doing so, he has caused Anna to reevaluate her situation. Broken hearts need time to mend and grief has no time limit. Hope Harbor is about finding healing, letting go of the past and being willing to take the steps necessary to do both. I loved this book with it’s powerful message wrapped in a charmingly sweet story. I received this book from Revell Reads in exchange for my honest review which I’ve provided here.